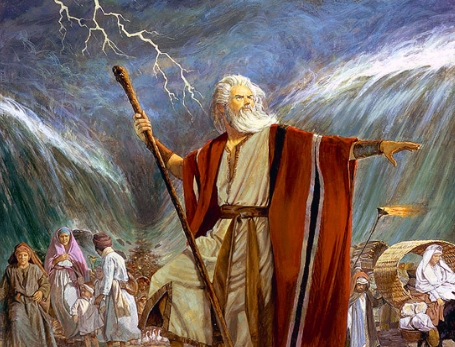 Do you think Moses knew what competent leadership looked like? Of course he did; he was raised in the finest schools in the world in Pharaoh’s palace. Do you think he knew what excellence was? Egypt had the best of the best. Do you think he knew about effective management and organization? He saw the pyramids being built; he knew how to plan and organize a project. Do you think he had to die to the way God was using him to lead the people of Israel? Was it humbling for him to lead this way; did it make him look like he didn’t know what he was doing? Absolutely! I said all this to point out that it isn’t that leaders like Moses or your leader don’t want things done the right way. But there are times when the Lord leads ministers in a way that is opposite of what you think is the right way, for eternal purposes. Incompetent Leadership or God’s Divine Leading? God told Moses to take three million Jews out of Egypt … tonight!!! Where is the competent planning and preparation? “What kind of idiotic leadership is this”? Then God told Moses to lead Israel to a dead-end by the Red Sea. “What kind of fool are we following”? Then God had Moses lead them to where there is no water. “Is this guy blind; I thought he knew where he was going”? He also married a woman who wasn’t even a Jew. “How can he do such a blatantly unbiblical thing in the eyes of the people”? God told Moses to go up to a mountain for 40 days to seek God’s will. “How could our leader leave us like this; to go on a leadership retreat at this time is unacceptable. He obviously doesn’t care about us”. These seem like valid questions, but they came from a rebellious people. God confronted these rebellious critics with judgment, even opening the ground and swallowing some of them alive. Then the people responded by accusing Moses of killing the people of God (Numbers 16:41). Time and time again, the direct and specific leading of God was met with ridicule and complaining by the people who lacked the discernment as to what was really going on in the Spirit realm. People still do the same things today. Some believers still perish in a wilderness of complaining and criticisms. Just like immature kids who only see things from their perspective, they have no idea what God is up to. Moses was invested in the will of God all the way. He was totally sold out for God, even if things made him look foolish. He was going to follow the Lord in spite of the embarrassment of looking like an incompetent leader and the relentless criticisms from God’s people who wanted an easier way of life. Some of the people who complain about others have lives that are so messed up you wonder how they would even attempt to criticize another person. Yet some of may also be well-educated. They may appear to be intellectually mature and quite successful in their occupation. They may look like they have their world all together. Their criticisms may even sound astute and sensible. However, their remarks are often the sharp arrows that come from a prideful believer’s heart whom Satan is using to destroy God’s puposes and your ministry leader. They may have a form of godliness, but they deny the power or authority of God in your leader’s life (2 Timothy 3:5). They fake submission to God and His leadership. They are only invested in the ministry if they get something out of it. They may offer their skills or expertise but not their souls to the Lord. They keep everyone at arm’s length, avoiding truly investing themselves in relationships or the future of the ministry. They are like Judas, who was part of the disciples, yet was never really one of them. These cross-less Christians have yet to truly take up their cross and follow the Lord. They are essentially still the same person who came to the Lord yet without any significant character or personality transformation. They are often completely unaware of their immaturity and lack of discernment. Every leader in every kind of Christian organization will have to deal with these kinds of people. Our book helps you deal with them and helps them to recognize what they can do to not hurt, but help the ministry move forward. Posted in Most Popular Articles and tagged Christian Maturity, Complaining, Jeff Krall, Rated "R" Christian Reading, Rebellion on July 12, 2012 by Jeff Krall. ← Do You Offer Your Skill or Your Soul to the Lord?